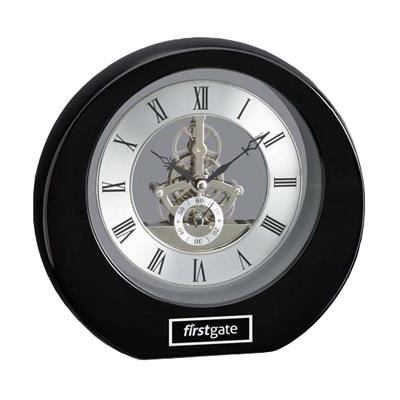 This contemporary black piano-finish clock with a chrome clock face and skeleton movement is sure to impress! An individual name and date or company name and/or logo is laser engraved on a black and silver plate placed on the front. Perfect for corporate or individual recognition such as graduation or service award. Max etch area is 1 1/2" (W) x 1" (H). Each clock is individually gift boxed.